Recently, I spent the afternoon with a friend poking around some local boutiques. We meandered through shops for a couple of hours looking at an eclectic assortment of home goods, local crafts, and plants. It was fun, relaxing, and felt like an indulgence because we don't do it often enough. Our last stop was at a local coffee shop where we continued out indulgence by sharing a cookie. It should be noted that this particular coffee shop serves huge cookies, so sharing was definitely appropriate. Normally, my cookie of choice would be chocolate chip, but the cookie that caught our fancy that day was a molasses cookie. It was a delicious cookie that reminded me of days log ago when I would come home from school to a plate of freshly baked cookies. The memory of that yummy molasses cookie has stayed with me and today I decided to make a batch of my favorite molasses cookies, called molasses crinkles, for the freezer. Baking for the freezer is one of the things I do regularly to manage my time and stress. I try to keep an assortment of sweets on hand in my freezer so I'll be prepared for picnics, family gatherings, potlucks, or whatever might require a dessert. This also helps me to reduce amount of prepackaged goods I buy. I like to know and be able to pronounce, the ingredients in my baked goods. Tip: Keep home-baked treats in your freezer for a no-stress way to be ready for picnics and potlucks this summer. This is a well-loved cookie at my house. 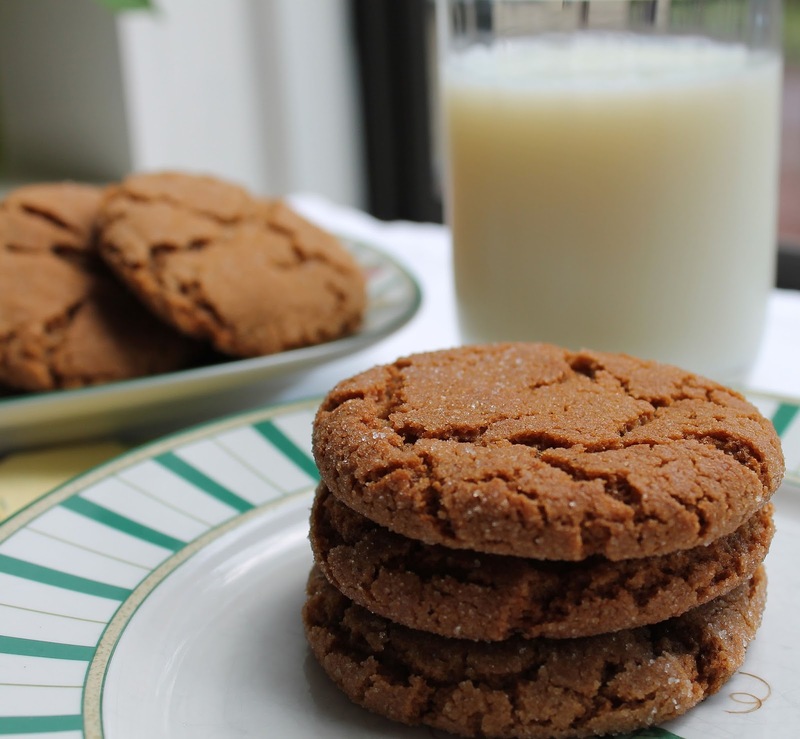 Some Internet research told me this recipe is also a long-standing American cookie favorite. I found reference to this recipe being included in the 1956 version of the Betty Crocker Cookbook. That surprised me because I actually thought it might be older than that. 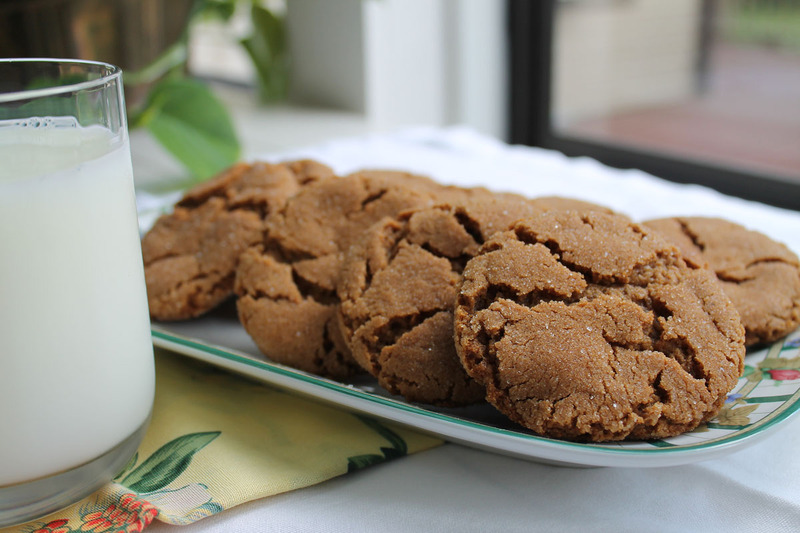 So, with deference and credit to Betty Crocker, I'm sharing this family favorite molasses cookie. It is sweet, aromatic and goes perfectly with a glass of milk. The addition of cinnamon, ginger and ground cloves makes this a spice cookie with a mouthful of flavor. Preheat your oven to 350 degrees F. Mix the brown sugar, shortening, egg and molasses in a mixer using the paddle attachment until combined. Add the remaining ingredients, except the granulated sugar. Mix to combine. Using a small cookie scoop for uniformity, shape the dough into balls. Dip the tops, only, into the granulated sugar. Place on a greased cookie sheet about 3 inches apart. Bake for 10-12 minutes until just set. You don't want to overcook these cookies. The Betty Crocker recipe indicates 13-16 minutes but mine always bake for exactly 12 minutes. Remove immediately from the cookie sheet to cool. Store your cookies in an airtight container to keep them from drying out. These cookies freeze well and travel well, so they make a perfect cookie for the lunch box and potlucks. These look so good and I can only imagine they smell amazing too! I can't wait to try baking these with my kids! These look amazing! And so super simple! I swear I can almost smell them through the pic! Yummy is right! I love to bake and eat cookies, and so does my family. Thanks for bringing your post to Blogger's Pit last week. These look like they would be so yummy. I love these kinds of cookies. I want to try them soon. Thanks for sharing it with Bloggers Pit Stop. 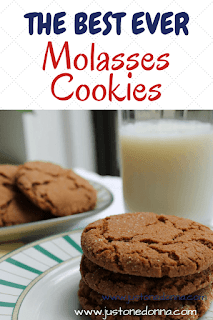 Donna, you make these molasses cookies so the recipe produces 28 cookies. How do you do it so the recipe yields 28 rather than 48? I like to make smaller batches. I always use scoops to make my cookies these days. I have a small scoop and a standard size ice cream scoop depending on which size I prefer for the recipe. For these cookies I used the standard size ice cream scoop to make 28 cookies. I checked the link for the recipe and it looks like the site changed the recipe to yield 24 instead of the 48 cookies used when I posted. Hope that helps.